In this text, the words “inspired by God” translate God-breathed. So, “God’s Word” isn’t far off the mark, in terms of nailing the concept. This is not an especially novel idea, since the Torah had long been venerated, but the author of 2 Timothy could not have been thinking of the gospels and epistles, because that collection of books hadn’t happened yet. Thus applying this verse to the New Testament is taking it out of context—and we’re not supposed to do that, right? 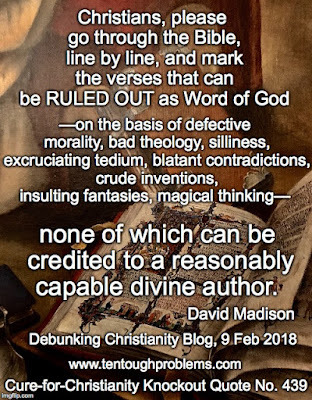 Nonetheless, pious folks today, especially of the evangelical variety, champion this text as proof positive that the Bible is the Word of God: “It says so right there!” But are these believers generous enough to include the scriptures claimed by other pious theists? Hey, it says all scriptures. Muslims and Mormons are very much in love with their own sacred books, confident that they too possess the Word of God. The bigger problem, of course, is that folks who don’t believe in the Bible in the first place won’t be convinced by 2 Timothy 3:16-17. Why should they? All-scripture-is-inspired-by-God is a faith claim, as much as Neptune-is-the-god-of-the-sea is a faith claim. Where’s the hard evidence, outside the Bible, to establish this claim? But it’s a losing proposition. Let me provide a similar faith-claim that shows exactly why. For example: Is the Roman Catholic Church right that the pope is infallible? I was raised on the Protestant side of a Catholic-Protestant divide in small-town Indiana. We ridiculed the Catholics for two things especially: all of those “idols” in their church (our stark Protestant churches had no statuary at all) and the very idea that the pope was infallible. Now, I’m pretty sure we had no idea, really, what that meant. Our idea was a caricature of the dogma—we did not know its history, the politics behind it, and the restrictions that apply (the pope is infallible when he speaks ex cathedra on matters of faith and morals…who knew?). So if anyone wants to make the case that the Bible is God’s word—and that it is self-authenticating—then they’ll have to find another way to do it. But, too bad, so sad, it’s still a losing proposition. Because, when push comes to shove, even many Christians would back away from defending the Bible as God’s Word—well, those Christians who have read it with some care. They might be okay with the protocol of swearing on the Bible (e.g., in court), but swearing that everything in the Bible is trustworthy, well—how can I put it?—that’s just a joke. How in the world can the Gideons and The American Bible Society still get away with the insane positioning of their product? Do they think no one is paying attention? Offered enough of an incentive—maybe a thousand dollar prize?—I suspect that a lot of Christian could rise to the challenge of listing a thousand Bible verses that fail to make the grade, that undermine all the hype about Word of God. “If we were to go line by line, I suspect that 99 per cent of the Bible would not even be missed” (Avalos) and “…inattentive readers will even be more surprised to learn that the Bible is a self-destructing artifact” (Helms). My primary point right now is that astute Christians can see very well that the Bible is a self-incriminating, self-destructive document. It falls far short of being self-authenticating; the claim in 2 Timothy 3:16-17 doesn’t hold water. How can the Bible have so much crap in it—without people noticing? Because they don’t want to notice it, and because the PR campaign has worked for hundreds of years. The Bible’s status is propped up by magical thinking: the idea that, once upon a time, a collection of books passed under the magic wand of ancient church bureaucrats and thus became God’s Word. To whom would this appeal? Note that 2 Timothy 3:16-17 is aimed at those who are sure they “belong to God.” Once personal identity and integrity have been thus compromised, you can kiss critical thinking goodbye. When folks are assured that they belong to God, and are under the tutelage of those who wave the magic wand, it’s not hard to get away with a lot of crap.